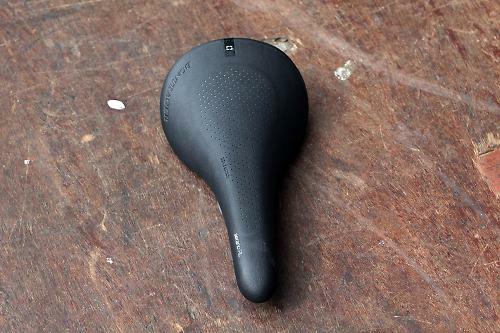 Though it might be brand new, Bontrager's Serano saddle actually draws on a shape that has been around for many years, which is why they're calling it a 'classic shape' on their website. The shape is indicative of a saddle like the popular Prologo Scratch, once favoured by Fabian Cancellara, and still favoured by me. A long flat and rounded middle section features with a raised tail and slightly dropped nose, with deep sides. It's the sort of shape that many cyclists will find comfortable. I replaced the Scratch on my test bike with the Serano and I didn't even have to alter the saddle height, such is the similarity. Out on the road and it felt virtually identical. There's a subtle difference in padding, the Serano being a touch firmer along the middle, but not enough to negatively impact comfort. I've clocked several hundred kilometres so far and haven't thought twice about the saddle, and indeed not rushed back to my old saddle. Of course saddle shapes are very personal and what works for one person won't necessarily work for another. I'm willing to bet this saddle shape will work for a lot of people though, it simply supports the bottom so well and provides adequate padding in the key areas. It's available in three widths as well; 128, 138 and 144mm. I tested the 138mm width and found it spot on, but you might want to try before you buy if you're not sure which you need. A good Bontrager dealer should help you out here.. All three saddles are 270mm in length. That's a smidgen shorter than the Scratch, but not enough that I really noticed. The saddle is a bit lighter, 220g on my scales, than the one it replaced. This RL model costs £90 with hollow titanium rails and a carbon composite shell. Spend £150 on the RXL and you get carbon rails with the weight dropping below 200g. The fact the saddle was first spotted on Andy Schleck's bike at the Tour of California last year suggests it was developed at the request of the team riders. Professional riders can be very fussy about saddles, reasonable given the miles they clock up, and this isn't the first time a pro has been involved in the development of a new saddle. With riders less free to choose any saddle they want these days, it's becoming common to see manufacturers willing to cater for a rider's particular requirements. Bontrager's also willing to try and cater for your particular requirements too. If you don't find you get on with a Bontrager saddle, you can exchange it for another within 30 days of purchase. It wasn't that long ago that you would see a rider on a saddle with branding covered over, but as manufacturers like Bontrager catch up, the days of pros riding favoured saddles seem to be long gone. 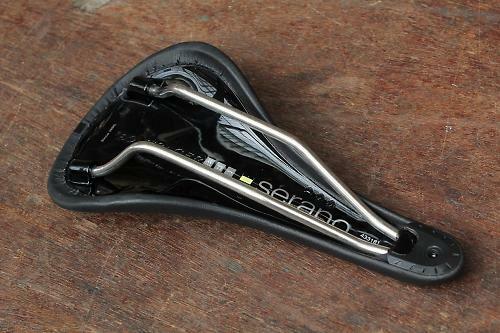 That's a good thing for the consumer, as it means more choice, and excellent saddles like the Serano are developed. Classic shape with smart looks and a good weight for the price. With its classic curves and futuristic inForm BioDynamics technology, the new Serano RL saddle offers the optimal combination of fit and efficiency for the aggressive road rider or racer. With a turned up tail, the Serano RL promotes a low, forward position on the bike, with a power pocket for max wattage. Hollow Ti rails and a carbon-composite shell keep it light and supportive. It's lighter and cheaper than the equivalent Prologo Scratch, not by much admittedly. It's as comfortable as the Prologo Scratch, which in my opinion places the saddle among the best currently available. Superb comfort, if it's the sort of saddle shape that works for you.